Remove the hard stems from the kale. Cut the kale into thin strips. Transfer into a bowl and add lemon and salt to taste (for one bunch of kale I usually do one whole lemon and maybe 1-2 tea spoons of salt). “Massage” the kale for a few minutes until it goes nice and soft. Take a nori sheet and lay out some of the prepared kale (it may be a little watery so squish it beforehand) – don’t throw away the kale juice just yet! You can put the kale all over the sheet, like a normal sushi, or you can put it just to the side like in the photo below. The taste will be the same, I just do it this way out of habit, but if you look at “normal” sushi, you would put the rice (in our case, kale) all over the sheet. Cut up the rest of the vegetables (be careful with the beetroot – your hands will be red) into thin strips, or use a julienne peeler. Use a bamboo mat to help you roll the sushi, or you can simply do it by hand if you’re careful. Just before you reach the end, wet the last centimetre of the nori sheet using either water or lemon juice This will allow it to stick to itself when you close it. 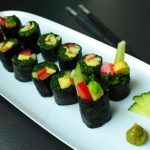 At the end, once you’ve rolled it, the nori sheet will still be a little dry, so you will want to soften it up a bit with any kind of liquid, i usually use lemon or the lemony juice that’s left over from making kale. Cut the roll into 6 pieces using wither a really sharp knife, or a ridged knife. Use anything else and it will fall apart. It helps to start the cut with the back of the knife and to work from the middle, i.e. cut the nori in half first, then work the rest, that way the filling won’t slide out of the sides.